When most people turn 65, they send in their pension papers, dust off the golf clubs, and settle into a life of retirement. If your name is Land Rover, though, you throw a party at an old English estate and invite all of your family to show up, from the oldest all-terrain bumbler to the newest luxury SUV and have a birthday cake delivered by a helicopter. Why? Because that's how Rovers roll, baby. 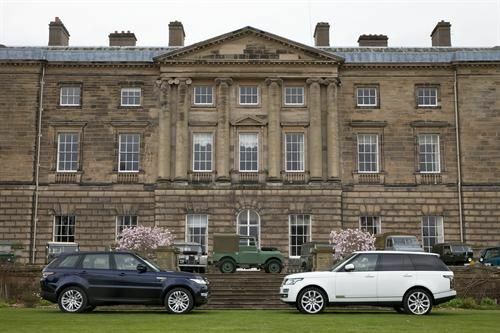 Birthday celebrations on Land Rover's 65th took place today at Packington Estate, near Solihull in the United Kingdom. Packington was the original proving grounds for Rover and Solihull is, of course, company headquarters. On this day in 1948, with the War just finished, Maurice Wilks opened the doors to a new production plant to build an all-terrain machine he'd first conceived of while doodling in the sand years earlier. That same year, the first Series I Land Rover, the HUE 166, rolled off the assembly line. The Huey was on prominent display at the event along with 149 other Rovers from throughout the company's history. Then a sleek Lynx helicopter arrived, bearing a specially-made, custom HUE-themed cake in honor of the occasion. Until the early 1970s, the Packington Estate was the testing grounds for new Rover designs, which featured many 4x4 world firsts, including andi-lock brakes, adjustable air ride suspension, and more. Since then, testing has moved, but the innovation hasn't as Land Rover has introduced to the segment technologies like Electronic Traction Control, Hill Descent Control, Terrain Response and more. Through the years, Rovers have been built to do a breadth of jobs, with accessories and special editions meant for doing everything from plowing fields to hauling royalty. From the first Huey to leave the line to the latest Evoque, Land Rover is synonymous with ultimate utility in a durable, ready-for-anything package.